Ans - A territory is a collection of accounts and user where in minimum read access can be given to the account. Territory management is nothing but account sharing mechanism based on account data. Territory management affects account and objects that have master detail relationship with account. Territory management gives and ability to expand sharing model based on account data. A territory can have multiple users, also a user can present in multiple territories. Criteria based on account data can be set, and based on that criteria access level can be set for the users under that territory. 20. What is apex sharing? Ans - Like manual sharing using configuration, records can also be shared using apex. Every object has associated share object where records can be inserted to share records with group or a user. For example account has accountshare, case has caseshare etc. Record access level, row cause, user/group can e specified while inserting the share records. 21. What is manual sharing in salesforce? Ans- Using manual sharing rules we can grant wider access to data to a set user. This can only used to give more access and not to restrict access to data. While writing a sharing rule we have to give criteria on which record should be shared(Based on record owner or defined criteria), To whom the record should be shared(Group,role or role and sub ordinate) and the access level(Read only, read/write). Manual sharing is available for some standard objects and all the custom objects. 22. What is OWD and its significance? Ans - Organization wide default is used to set default access level for various standard objects and all custom objects. Default access can be set as Public read only, Public read write, Public read write and transfer for different objects. For example if the record access level is set to private then the records will be accessible only to owners, users above in role hierarchy and if it shared using manual sharing. Using OWD we can also set if the records can be set using role hierarchy for custom objects (For standard objects records are always shared using role hierarchy). 23. What is test coverage and what is its significance? 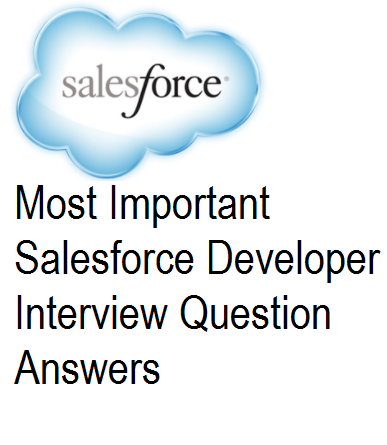 Ans - Apex code written in salesforce needs to tested using test classes. Apex code gets test coverage depending on the logic written in test class. The functionality implemented in an apex class has to be tested using test class. Salesforce does not allow deployment if the entire org has coverage less than 75%. 24. What are standard controllers in visualforce? Ans - Standard controller when used in a visualforce page gives the same functionality and logic as used for standard pages. For example standard button save functionality will be avaibale as it is and we need not write any method to execute it. Similarly it also gives all the action behaviour and look and feel of the standard object. To specify a visualforce page as standard controller we have to specify standardcontroller="objectname"